Make the most of your footage with some top hardware – here are eight ace video editing laptops for all needs and budgets. Hoping to buy a new laptop for video editing in 2019? You're in the right place. Whatever skill level you're at, we've got an option for you below – from high-powered Macs and Windows PCs through to Chromebooks and budget video-editing laptops. Having the right video editing software and hardware can make a world of difference. After all, choose the wrong tools and you'll waste hours in post-production wrestling with erratic touchpads, squinting at pixelated images and drumming your fingers as your work slowly exports. No one wants that. You might be surprised to discover that some of the best video editing laptops are gaming systems. With lashings of CPU and graphics power, they’ll chew through creative software and encode videos faster than any standard laptop. For that reason, our pick for the best video editing laptop is the Acer Predator Helios 500. Our pick for the best video-editing laptop right now is Acer’s 17-inch gaming-focused Helios 500. This Windows machine has a few tricks up its sleeve to make it one of the fastest laptops you can buy for any kind of multimedia work. Along with a built-in 2TB hard disk that’s great for storing loads of media files, as well as 16GB of memory and a 512GB SSD, it has an Nvidia GeForce GTX 1070 – a high-performance graphics card that can accelerate plugins and visual effects. But it has another trick up its sleeve, since you can either order it with with a six-core Intel Core i9, or an eight-core AMD Ryzen processor. Eight cores can outperform six, and in some cases, this nudges the AMD Ryzen slightly ahead of Intel’s Core i9 chip for video editing. Apple’s flagship 2018 MacBook Pro is near the top of our list because it remains a superb laptop for video editing. It comes in two screen sizes, with the larger, more powerful 15-inch model now equipped with a six-core eighth-generation Intel Core-i7 processor and up to 32GB of memory – which will make a big difference when rendering and exporting video. The true-tone Retina display looks brilliant, and the Touch Bar can be a very useful tool when working with video editing software. While the pricing quickly skyrockets for models with the largest storage capacities, the fast Thunderbolt 3 ports let you keep your massive high-resolution video files on external storage arrays for editing. The Windows 10-based Dell XPS 15 is a wonderful-to-use piece of kit in every department. The beautiful combination of 4K 3,840 x 2,160 resolution InfinityEdge display (the bezel is barely there) and top-of-the-range graphics card will make your footage sing as you chop and cut. The Nvidia GeForce GTX 1050 card is powered by 4GB of video RAM, which doubles that of the MacBook. The graphic capabilities of this beast of a PC top anything else in this price range. There's a Kaby Lake processor and 8GB of RAM as standard under the hood, but you can pay extra to ramp up the RAM to a roaring 16GB. 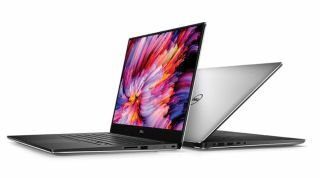 It's also worth noting that there is an update to the Dell XPS 15 in the pipeline. The newer version should have an OLED panel, and may have the webcam in a more sensible place. This may also mean the price will drop on older models. The likes of Dell, Apple and Microsoft have dominated the top of most 'best laptop' charts for a while now, Huawei been busy designing a PC to break up the monopoly. With the staggeringly good Huawei MateBook X Pro, it has well and truly achieved that goal. There's little doubt that you'll be wowed by the gorgeous design of the X Pro, but it's the hidden inside parts that impress the most. You know that you're going to get a unit powerful enough to process heavyweight video files with ease when you see the 8th generation Intel chip, 512GB SSD and up to 16GB RAM on the spec sheet. But what you won't see on there is any indication of just how long the battery will last you – handy if you plan to work on your videos on the go. And your creations will look at their very best on the dazzling 13.9-inch display boasting a 3,000 x 2,080 resolution. This isn't merely one of the best laptops out there for editing your footage, we reckon it's among the very best laptops in the world right now. You don't need to be in the film industry to know that the sequel is rarely as good as the original. But quite unlike Jaws, Speed and The Exorcist, the Microsoft Surface Book 2 is a definite improvement on the first generation. In fact, the Microsoft Surface Book 2 is a mere whisker away from toppling the XPS 15 for best Windows laptop for video editing. But when it comes to 2-in-1 laptop-tablet hybrids, there are none finer. Give the 15-inch screen a tug and it satisfyingly detaches from the keyboard, enabling you to use it as a huge tablet. Handy if you have a work in progress that you want to pass around a table. But, coming with the Surface Pen stylus, it also means you can get more control using the touchscreen for seamless video edits. Study the Surface Book's spec sheet and it impresses at every line. The 3,240 x 2,160 resolution display is sharper than the majority of laptops on the market (including every MacBook in existence) and 4K footage will look just how you imagined it. The presence of the GPU and Nvidia GeForce chipset gives it yet a further boost in the graphics department, while the stacks of RAM and state-of-the-art Intel processor (all configurable) make it a processing monster. If the words of praise keep getting drowned out by volume of the price tag, then the original Surface Book is still available and would still make a more than competent companion to any video editor. You have to settle for a 13.5-inch screen, but the savings can reach as much as a grand. Before 2018, the MacBook Air was Apple’s most affordable Mac, but only capable of basic video editing as it hadn’t been updated for years. That all has changed. The newest MacBook Air now has a high-resolution display, faster eight generation dual-core processor and more memory, all of which make a big difference to its video editing credentials. Unfortunately, it’s no longer the affordable option it once was, but it could still be called Apple’s most portable video editing laptop. The Lenovo Yoga 720 hits a real sweet spot between price tag and capabilities. It may not quite have the power or street smarts of the premium machines from Apple, Microsoft or Dell, but there's much to like – including the smaller impact it will have on your bank balance. It manages to offer a full HD 15-inch display for somewhere close to a grand, if not under. And with a Nvidia GeForce GTX 1050 graphics card as standard, you'll have the ability to experiment with effects not alien to those more powerful machines. It lacks none of the elite finish either, with the aluminium casing and backlit keyboard common to more expensive laptops. We do rather rue the lack of an HDMI out port. If you like to instantly transmit your work in progress to a bigger screen then you'll need to find another way of going about it. But as far as compromises go, it feels like a small one. You still get an accurate touchscreen for fingertip control of your footage and sufficient processing power for frustration-free use. It isn't easy to find a decently specced laptop with a large screen and still get change from £500/$500. But that trusty stalwart HP has somehow managed to produce a cheap laptop that isn't a disaster zone: the HP Pavilion 15. This isn't one for the pros, but if you're a beginner or keen amateur learning the ropes of video editing, the Pavilion is a good choice. Even the entry-level models have loads of storage for rolls of footage, and a little extra cash can get you more RAM, a better Intel processor or a full HD display. MSI has delivered the goods here with the Prestige P65 Creator, a fantastically light laptop that looks as great as it performs. An optional six-core Intel processor, Nvidia GeForce graphics card (up to a GTX 1070) along with 16GB of memory will make your footage render at super fast speeds. It has some great visual touches, with chamfered edges around the chassis, and a lovely large trackpad. If you snag the limited edition version, you can get a 144Hz screen as well.